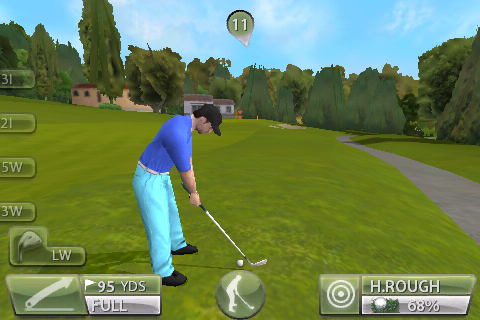 Tiger Woods PGA Tour - iPhone App - Are You Screening? As I mentioned in the preview review, back at the EA Season Opener, one of the coolest things I got to see was an early version of Tiger Woods PGA Tour for the iPhone. Now that it’s out, it’s even better than I thought it would be. For an App, it amazingly captures the game features you expect from the EA franchise. The graphics are great, and apart from a couple of small hiccups the gameplay is fantastic as well. The PGA Tour mode of play is pretty much the standard option here, and trying to make it on the tour is the name of the game. You’ve got the same layout as the regular game, more or less, with a very simple interface for switching clubs or type of shot (full, chip, punch, flop), and the main screen displays the wind with direction and your lie. The only drawback on club selection is that you can be 12 inches from the hole on the very edge of fringe, and the game is going to make you chip. Your swing works by way of a meter. When you’re ready to take your shot, this meter pops up. 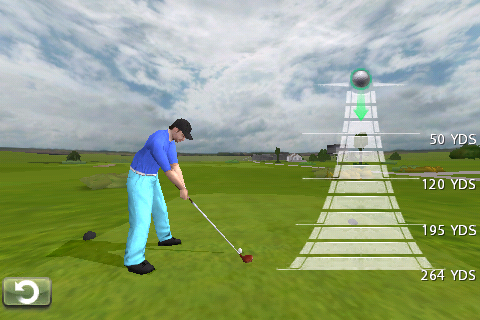 Touch the ball at the top, and then slide down the meter to the level you want, and slide back up to take the shot. Slide all the way down and pause, and the meter will start to glow red, giving you your power boost. But, hold it too long and the meter will turn blue, and you’ll lose power. The meter widens at the bottom to allow for hooking and slicing. Pull down toward the left side and you’ll hook, to the right and you’ll slice. The game also has a nice aiming feature. Tap on the bull’s eye icon, and you’ll be transported forward to where you are aiming. From here you tap and drag your marker around to the spot you want. 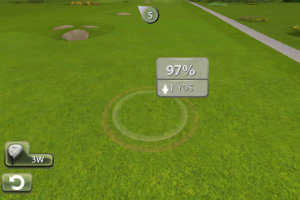 The club selection and percent needed to hit will update as you move. These are my own screenshots, and as you can see the visuals on the game are pretty impressive for an App (even if it is tremendously hard to see in daylight). The dynamics of the game all come together very well, and you get a surprisingly similar experience to playing the game on any of the consoles. You’ve got the opening flybys on each hole, the commentators chiming in, even background noises. You’ve even got spin. While the ball is in the air, swipe across the screen in the direction you want, and you’ll achieve the same spin you’re used to from the console games. It does take a bit of getting used to though. I went from missing the cut on three straight tournaments (and starting a new profile, because I was out of money) to winning the next tournament I played. Even though the meter is going to give you yard marks as you prepare to swing, it can be a little tricky to get the feel for the exact amount of swing you’re looking for, especially with the degree of accuracy you want in golf. The difference between 85% and 90% isn’t all that much, but when one of them lands you in a sandtrap, it’s a difference you don’t want. But, once you get the hang of it, it isn’t terribly hard. Also surprising considering the limitations to combat with an App game, there are 7 full courses available. Pebble Beach, St. Andrews, TPC Sawgrass, TPC Boston, Doral, The K Club, and Fancourt. Each of them as precisely displayed as the regular versions of the game. 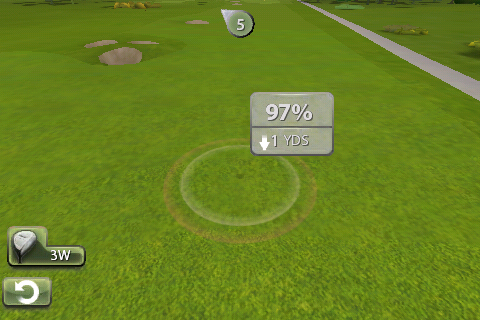 The only negative I have is that there is a certain length putt (something just outside “gimme” range) you can leave yourself which is going to automatically bring up a power level that isn’t going to make it to the hole no matter what you do, and I don’t know how to change that. Well, and on occasion the ball will roll right over the hole even if it only goes two feet past, which is not particularly physics-savvy. But, those are pretty minor glitches. And, there’s the beauty of App games, because they might just fix that. All in all, this is a staggeringly impressive App game, and really throws open the doors on App possibilities. The incredible visuals put together with the complex game mechanics make it really hard to believe you’re playing this on your phone. It’s also a perfect choice just by the nature of the game, because whenever you have a minute you can just knock through one hole real quick, and the App of course saves your progress automatically when you exit.